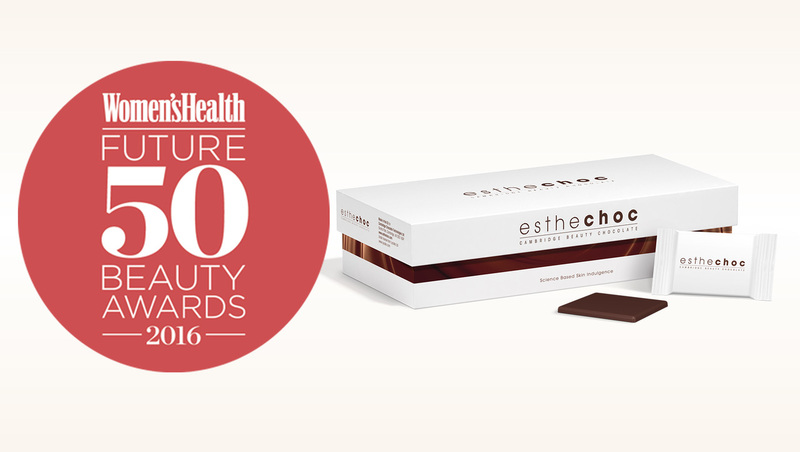 And the winner is… esthechoc scoops Best Beauty From Within Award at Future 50 Beauty Awards 2016 by Women’s Health Magazine! Esthechoc – Cambridge Beauty Chocolate is among one of the 50 most innovative, well-crafted beauty products of the past year, chosen by elite panel of dermatologists and cosmetic scientists. After receiving the Grand Prize and Skincare Award at the Beauty Challenger Awards 2015 in Paris, now it’s time for another prize – the Best Beauty From Within product. Women’s Health Magazine said about esthechoc: Chocolate that is good for you? Powerful antioxidants including anti-ageing astaxanthin and epicatechins improve dermis circulation and turn your daily treat into a skincare ritual. Esthechoc scoops Best Beauty From Within Award as the natural product that goes back to basics with unrivalled efficacy. Esthechoc is the world’s first anti-ageing chocolate and a breakthrough in skin biomarker management – in other words it is a skincare nutricosmetic in a unique form of low-calorie dark chocolate. It increases oxygen saturation of tissues, improves oxygen transport in plasma and reduces oxidative damage in mimicked inflammatory conditions – based on clinical studies at Lycotec Ltd., Cambridge, UK. It was developed by and based on the technology invented at Cambridge Chocolate Technologies, a company created by Dr Ivan Petyaev as a spin-off from Cambridge University, UK. Dr Petyaev is a medical doctor and cardiologist. He specializes in the development of personalized diagnostics, pharmaceuticals, nutraceuticals and cosmetic products. Katie Mulloy (editor of Women’s Health), Gabriela Daniels (programme director of science at London College of Fashion’s business school), Jamie Stevens (celebrity hairdresser), Jo Fairley (leading beauty writer and co-author of Ultimate Natural Beauty Bible), dr Terry Loong (London-based cosmetic doctor specialising in hormone and acne treatments), Azzi Glasser (award-winning master perfumer who has created fragrances for Bella Freud and Agent Provocateur), Gabriela Peacock (model-turned-nutritional therapist and founder of GP Nutrition), Debbie Thomas (skincare and laser specialist), Ruth Crilly (supermodel-turned-beauty vlogger-turned-entrepreneur with her own haircare brand COLAB), Amelia Jean Jones (health and beauty editor at Women’s Health), Sam Bryant (international make-up artist who’s worked with brands such as Burberry and legendary photographer Mario Testino). Read more about best natural beauty products that actually work here.